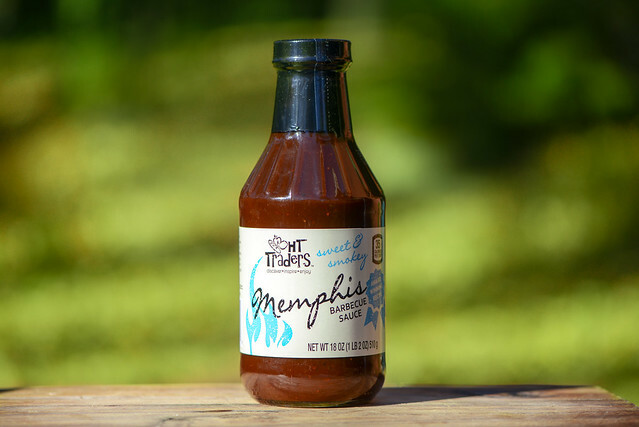 A well balanced and layered barbecue aroma doesn't translate to the most robust flavor or great grilling performance in this Memphis-style sauce. After moving from New York, I had to get familiar with my new grocery store landscape in Durham. Harris Teeter is prevalent in this area and I quickly learned that, with their more varied selection than other big name supermarkets, it would become my go-to for the majority of my one-stop grocery shopping needs. 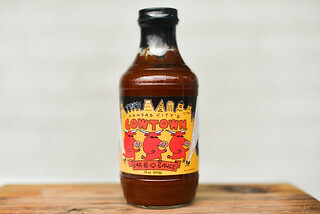 Luckily Harris Teeter, which got its start in Charlotte back in 1936, also has some quality goods under its own brand name, and having decent experiences with a few of them, I decided to branch out and give one of their barbecue sauces a try. 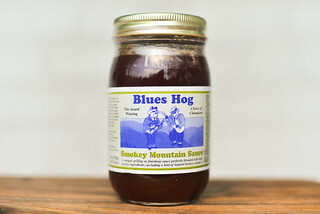 First whiff of this sauce fills the nose with a very pleasing barbecue sauce aroma that's a well balanced mix of tomato, sugar, molasses, vinegar, and smoke. While no one component is overstated, the deep molasses, backed up with a smokiness, are the most dominant characteristics. Sitting behind the primary aromas is a mellow garlic, onion, and earthy, not spicy, chili, all adding a bit of familiar complexity to round out the standard barbecue sauce aroma. This dark maroon sauce has a glossy sheen and is semi-opaque. 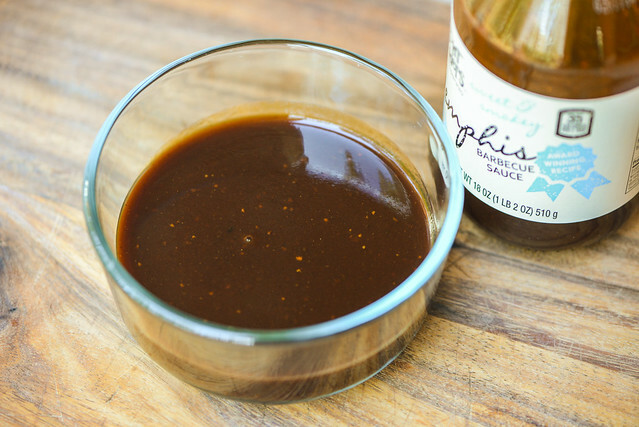 That makes it easy to see the tons of spices—which come in black, white, and red specs—that also add the slightest texture to this otherwise smooth sauce. It has a thickness that sits right in the middle of the scale and a thin syrup-like consistancy that has the sauce falling off a suspended spoon first in a large glob, following by a fast, continuous, slightly uneven stream that ends with a few fast drips and a medium coating of sauce left clinging to the silverware. The first taste of this sauce is oddly flavorless. It's only after sitting on the tongue for a couple seconds that a sweet tomato profile begins to take shape. Quickly molasses comes in along with a light smokiness to add depth to the upfront sugary profile. As the sauce settles on the tongue longer, vinegars adds a tang while all the spices present in the aroma—garlic, onion, and chili—create a background complexity. Right at the end, the tartness ramps up along with a mellow heat, which leaves a slight burn that's tempered by the still present sugar and tomato. This sauce coated the chicken in a thin, even layer that baked down well and gained heft after multiple brushings over indirect heat. 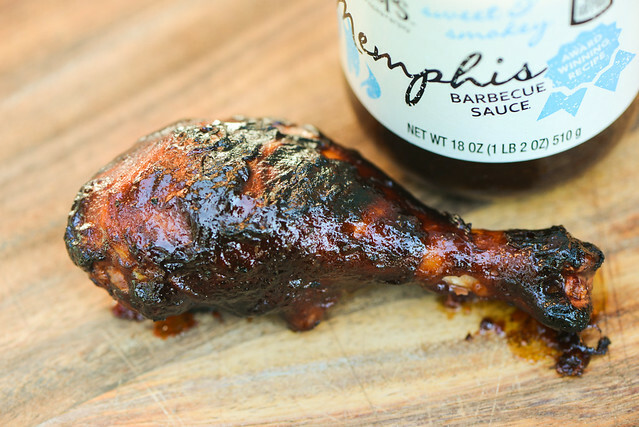 After being moved to direct heat, the sauce burnt almost immediately, leaving the leg with an overly charred appearance. Unfortunately, that excessive charring made the chicken taste pretty burnt, which masked a lot of the other flavors. What did come through was a bit of molasses and tang with a dash of smoke. The initial whiff of this sauce made me excited with what seemed to be a well layered barbecue sauce profile, even if it was a bit formulaic. That made the initial flavorless taste a bit confounding, and while all of the components in the aroma eventually made themselves known, they were a tad understated. 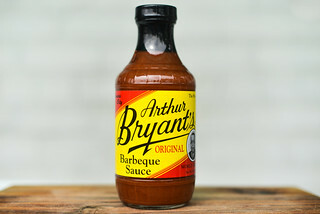 That, within itself, is not a bad thing (too many barbecue sauce are "bold" to a fault), but when the sauce burned on the grill, the overall mellow flavor was drowned out by the char, translating to a primarily burnt tasting piece of chicken. So while I've been impressed with some other Harris Teeter goods, this one fell short of expectations. Still, out of the jar it was decent enough that I would think it to be a good condiment for burgers, fingers, fries, and the like, but it might not have the heft to stand up against strong smoked meats and with its tendency to char, I would keep and extra watchful eye if you choose to use it on the grill.